Dimensions (HxWxD): 2.25" x 0.85" x 0.35"
This beautiful Larimar Asymmetrical Teardrop Pendant with Fancy Chain pendant, weighing 16 grams, exclusive of chain, was designed and fabricated in the Dominican Republic, the island nation where this sea-blue gemstone was discovered. 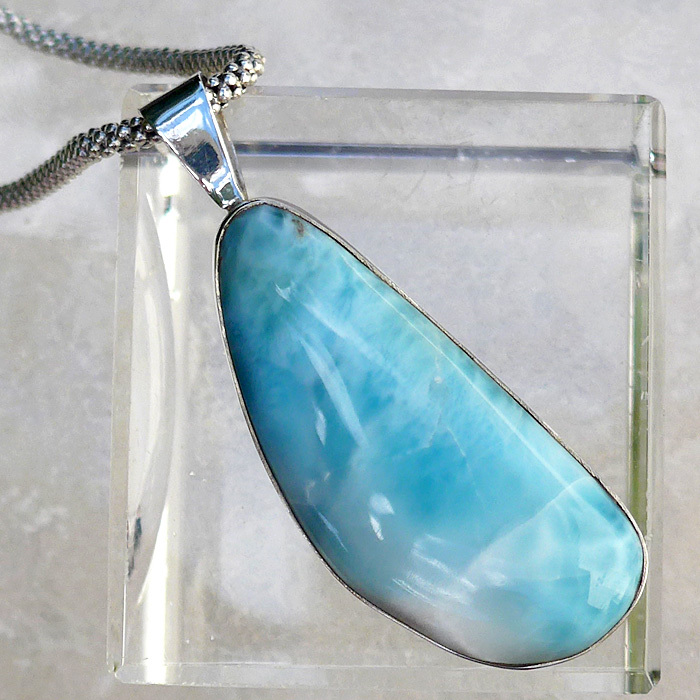 This Larimar pendant is 2.25 inches from the top of the bale to the tip of the setting and is set in Hammered Silver and comes with a thick Balinese sterling silver chain, complete in its own velvet jewelry box. 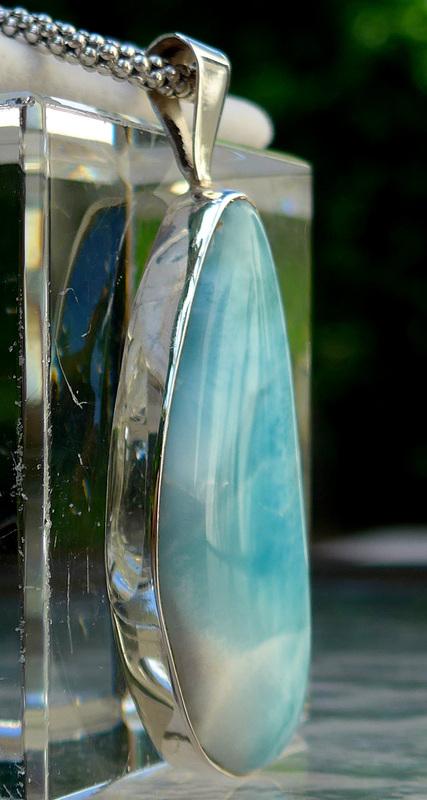 This powerful Larimar pendant works to open and equilibrate the upper chakras, and empowers the bearer, helping the individual get in touch with their own inner truth, and enhancing the ability to communicate that inner truth to others, on an individual basis, and through the mass media. 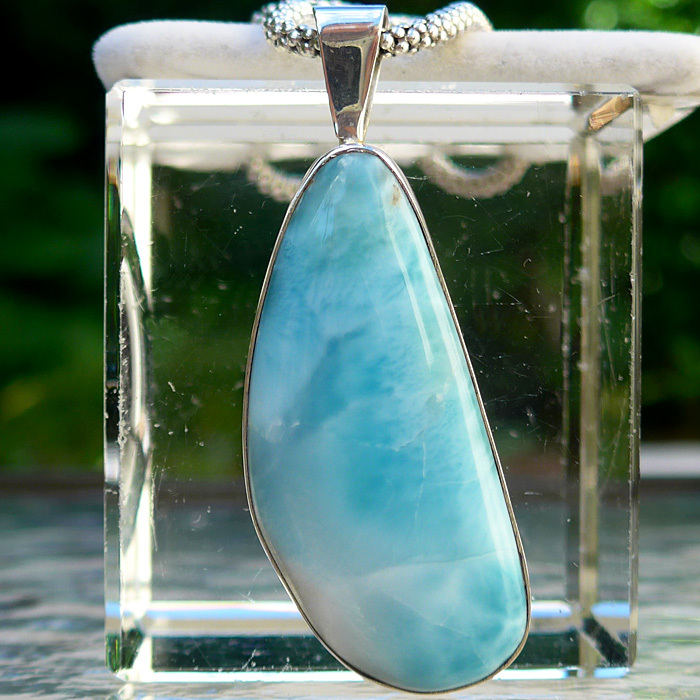 Our experience with Larimar is that this gemstone is a Blessing from the Goddess, conferring comfort, nurturing energy, and providing a kind of energetic emotional rescue. Larimar has a relaxing energy signature, soothing body, mind and soul while clearing the mind and providing the kind of safe, secure, grounding energy that we all need in these difficult times. Note: weight above is shipping weight. Net weight 16 grams excluding chain.